When it comes to dining at Walt Disney World, there are a ton of great locations to enjoy some awesome food! But when you ask my 10 year old daughter Sophie, the best locations are the ones that have character interactions! 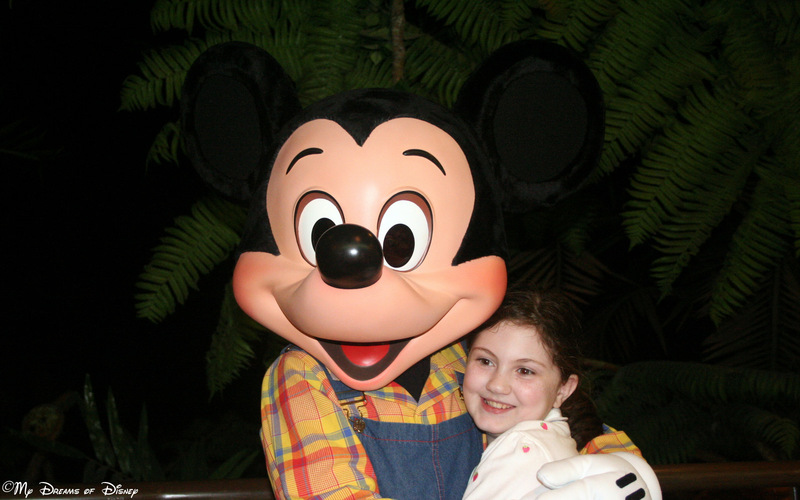 So, from my daughter Sophie to you, here are her favorite Character Dining Locations at Walt Disney World! As you can probably guess from the picture, Sophie’s favorite character restaurant is the Garden Grill Restaurant. Located over at Epcot’s The Land Pavilion, this restaurant is one of our absolute favorites! If you haven’t eaten here before, the food is served family-style, and there are three different selections: a beef dish with sides, a turkey dish with sides, and a fish dish with sides. It is really good! Also, the restaurant slowly revolves, which will show you all of the seasons of the Land Boat Ride below. Lastly, you are visited by Mickey Mouse, Pluto, and Chip & Dale while you eat! Great characters! Sophie loving on her Pooh Bear! At number two for Sophie is The Crystal Palace! This “Buffet with Character” features the antics of your loveable friends from the Hundred Acre Woods! 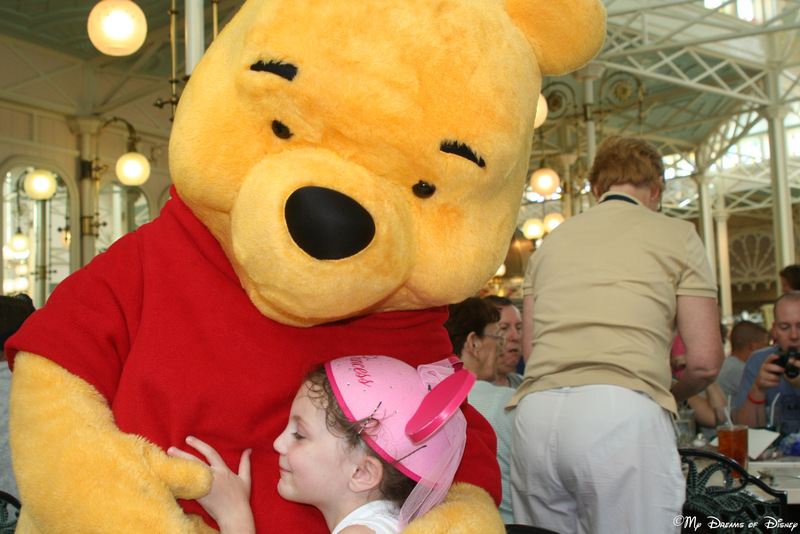 Winnie the Pooh, Piglet, Eeyore, and Tigger all swing by for a visit while you eat, and they also have little parades throughout the restaurant that your kids can enjoy! The food is your standard Disney buffet food, with a carving station, some other dishes, and other goodies including kids options. 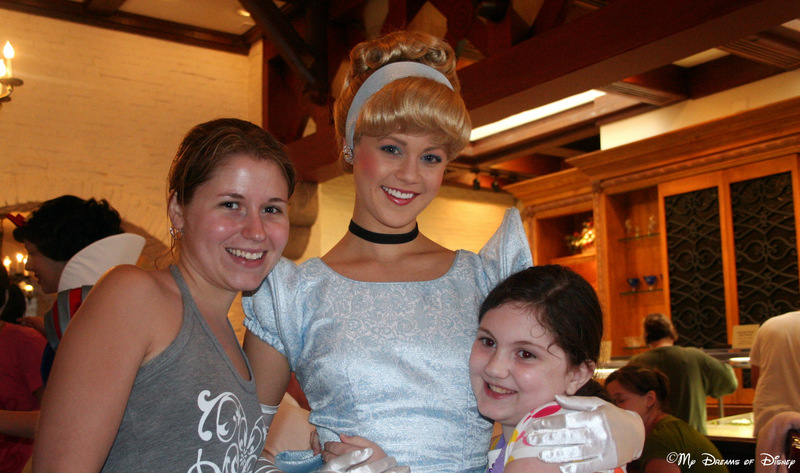 Sophie loves her Princess encounters, so for her, eating at Princess Storybook Dining at Akershus Royal Banquet Hall has become one of her must do dining experiences! Try it out and I think you’ll like it also! Akershus is located over at the Norway Pavilion at Epcot’s World Showcase, and is a terrific value for a one table service credit restaurant! The food for dinner is Norwegian, for breakfast, it is your standard American breakfast. For dinner, you are first able to enjoy a cold buffet of meats, cheeses, salads, and breads, then you can order your dish from the menu. My favorite dish there is the Traditional Kjottkake, which is similar to Swedish Meatballs, and is served with Lingon Berries and a tasty garlic mashed potatoes. In addition to the great food, the characters that we have met here include Belle, Cinderella, Snow White, Ariel, Princess Jasmine, and even Mulan once! Also, this reservation includes a photo package, one package for parties of 1-4, two packages for parties of 5-8, and three packages for parties of 9-12! A mix between terror and excitement with Stitch! 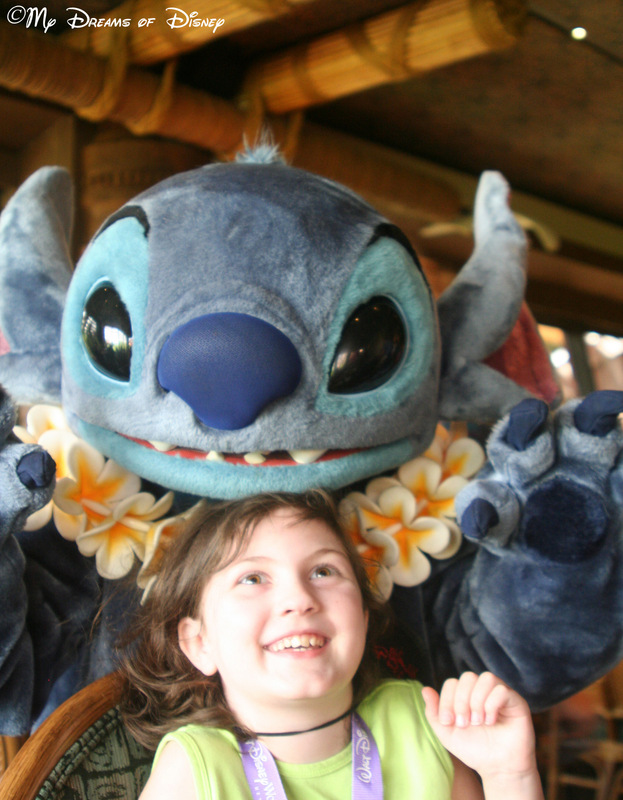 Sophie’s fourth favorite Character Restaurant is ‘Ohana for breakfast! We ate there and loved it! The characters that you have there are Lilo and Stitch, and Mickey Mouse and Pluto also. Located over at the Polynesian Resort, when we ate here it was the first time we had been to the resort, and really enjoyed the atmosphere there. We highly recommend it if you’ve never been before! The food is served family style and consists of great juices, eggs (I enjoyed them even though I don’t care for eggs that much), incredible sausage, and much more to satisfy any early morning Walt Disney World traveler’s hunger! In addition to the character interactions at your table, if memory serves me correctly, you can also march around the restaurant like over at The Crystal Palace periodically with the characters! Lastly, another of Sophie’s breakfast favorites is the Cape May Cafe! Located over at the Beach Club resort along the Boardwalk area, this breakfast location is kind of out of the way, and as such, it didn’t seem that it was really all that busy! That may have had something to do with the time of day we ate there though because we did schedule a later breakfast time so that we wouldn’t need to stop that soon for lunch. The theming of the restaurant is great, and the characters that we met there included Minnie Mouse, Goofy, and Donald Duck! Breakfast is a standard breakfast buffet of Mickey Waffles, bacon and sausage, eggs, danishes, juice, fruits, and a whole lot more. We loved eating at the Cape May Cafe in part because of the great clothing choices that the characters had, and highly recommend this restaurant for any that haven’t tried it before! Chef Mickey’s — we’ve been here, but only for dinner, so we are thinking about a trip here for breakfast in June 2012 when we visit next! Cinderella’s Royal Table — While we really enjoy dining at the Castle, this restaurant costs 2 table service credits, and just doesn’t feel like it’s worth it to us. Do this once with your princess, and then head over to Akershus from then on. 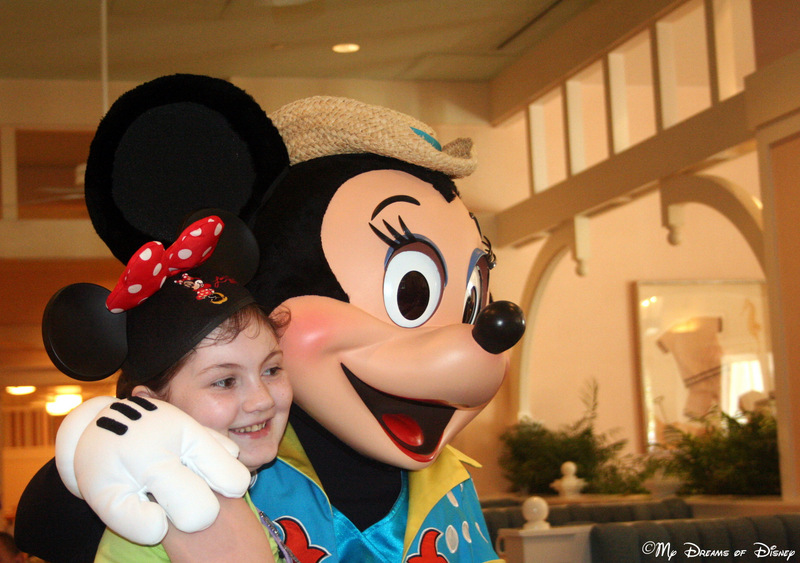 We hope that you have enjoyed your trip to the favorite character restaurants of my daughter Sophie! If you have any comments about any of these, please feel free to leave them on the page, and let me know which ones are your favorites! I have never eaten at the Garden Grill. Would love to know about the food there. Good? Or was it more an experience thing? A wonderful filet of beef with a special sauce. A wonderful turkey breast with some sort of cranberry sauce — yummy! An incredible fish dish — it’s a sustainable fish if I remember correctly. All of the entrees are served with various roasted or grilled vegetables. For dessert, there is a great fruit crisp, something along the lines of an apple crisp, but it may be different fruit if memory serves me correctly. The food is incredible — very good comfort food! Check it out, you won’t be sorry! Great post! I’ve been to Garden Grill, Cinderella’s Royal Table and Crystal Palace for B’fast. Went to Chef Mickey’s in 1981 but don’t really remember it! 🙂 I need to try the others on your list… but I’ll choose the b’fast at Akershus! !